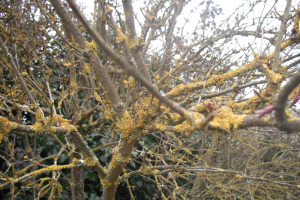 Observation - Xanthoria foliose lichen on tree - UK and Ireland. Description: yellowy orange with eye spores found in rural grassland area. yellowy orange with eye spores found in rural grassland area.